Combine flour, baking powder and salt. Make a well in the center. Combine egg and milk, mixing well. Pour into well in flour mixture and stir with fork until just blended. Drop by tablespoons into boiling broth or gravy. Cook 10 minutes uncovered. Cover pot and cook another 10 minutes. DON'T PEEK. That's the secret to light and fluffy dumplings! 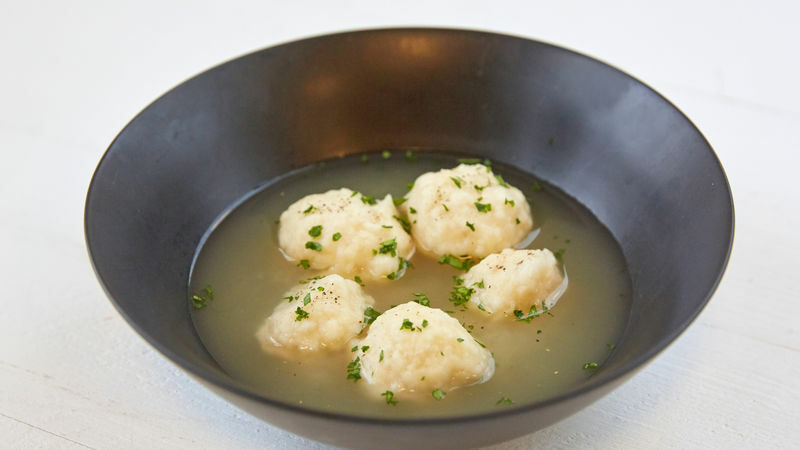 Few foods are more comforting than a classic chicken and dumplings recipe but there are plenty of people that are intimidated by the thought of making it from scratch. These fluffy dumplings are made with only five ingredients and we’re willing to bet you have the ingredients in your kitchen right now! The trick to making a batch of fluffy dumplings is to cover the pot while the dough cooks and resist the temptation to lift the lid for a sneak peek! The term “dumplings” is used rather loosely around the world but its essence is dough wrapped around a filling or no filling at all. The dough can be boiled, fried or even baked, and it can be sweet or savory. They can be enjoyed on their own, in a casserole or in a soup which is our personal fave!